My kids’ baseball league has a big party at the end of the season, and since this was our first year, and I don’t know anything about baseball at all and was basically useless to the effort all season, I decided to let my light shine where it shines best, and that is on the party aspect of team sports, and dessert. Themed dessert, that is. 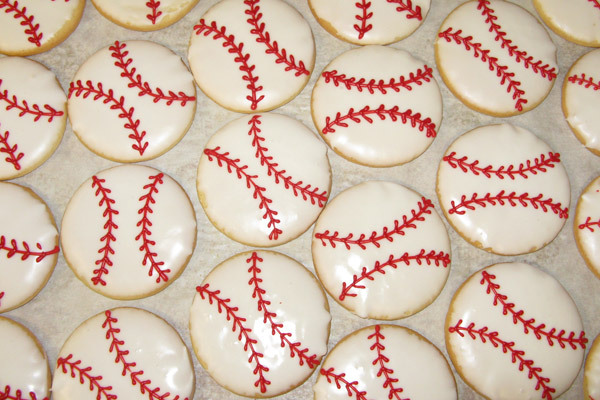 I decided to make baseball cookies, and using the internet as my own personal design studio, found these, which are super easy, but in clusters of several dozen look very impressive. 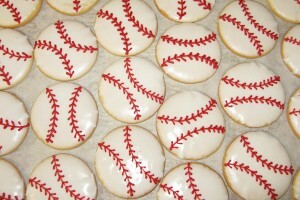 And, of course, are perfect for a baseball party. 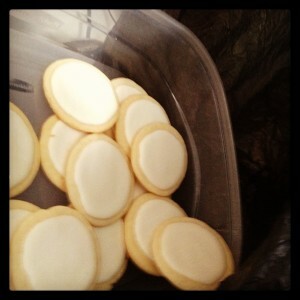 These are just simple sugar cookies (a six ingredient recipe), rolled out and cut into circles, and then iced twice. Easy-peasy. Is it time for a parenthetical aside? When I went looking for inspiration photos, I found tonnes of sugar cookies like this for sale on Etsy. People, for real now, who is buying food from Etsy? Are you not afraid that it is being made in hoarder-level kitchen filth? Don’t click that link if you value your mental health, by the way, or don’t want to end up compelled to scrub your entire house all afternoon. Maybe I am just a big germophobe, but I can’t imagine buying food that isn’t made in a clean commercial kitchen by people following food safety and health code conventions. I made a timeline for making the cookies. Double icing means a day in between for the base coat to ‘set’ hard, and I got knocked off of my baking schedule when one of my kids popped up in the middle of the night to announce she didn’t feel well, right before she yakked up all over our bed, which, it turned out, was the second bed she threw up on that night. Luckily, I love a good load of 2AM laundry, and we got her cleaned up, the beds remade, her tucked in, and I reminded myself that I could sleep a little later and then stay up late the next night to finish the cookies, so no big deal. No. Big. Deal. I would take one for the team, as they say.And it worked, sort of, until the next day, when the Yakker’s sister was sent home from camp in the middle of the morning, for yakking up during kickball. But, I reasoned, I could still make this work. I could stay up all night and finish the cookies now, before the big party, and maybe even sneak a nap in. Yakker #1 already felt better, and Yakker #2 wasn’t too discombobulated by the yakking up she was doing, and was mostly dozing and watching TV. I could do this. After both Yakkers went to bed, I scrubbed down my kitchen and my hands with bleach, and started the basecoat of icing on the cookies while my husband took himself a very uncharacteristic 8PM nap, a nap that turned into a pretty showy display of yakking up around 11PM. Awesome, I said to myself. Now I can stay up all night and make this cookies, and then take the kids, by MYSELF, to the party, on no sleep at all, because Mr. Crappy Timing decided to get himself sick, too. No matter. I will take one for the team. At 2AM, I finally fell into bed, rationalizing that the next morning, I could easily do the final icing of the cookies and have time for it to dry – it was just the fancy red lacing, and that would take no time to dry, right? Obviously, I wasn’t factoring in how long it would take to painstakingly draw all of those lines with a piping cone and a tiny little icing tip. I was exhausted, and of course I was, what with containing all the sick people to a small part of the house and trying to make them just shut up already and get some sleep, while simultaneously making and icing 6 dozen cookies.And really, the kids were already on the mend. This might be a viscous stomach flu, but it only last for about 18 hours. Thank G-D, because any longer and I would have had to start day-drinking (again). About an hour and a half later I was lying on the cool tile of the bathroom floor, having an out-of-body experience, no joke, for real, I am pretty sure I was hovering near the ceiling, watching myself projectile vomit across every surface of that room. It was the sickest I have ever been, including that time in college that my boyfriend and I got e.coli poisoning from a chain restaurant. I will spare you the details, but it was bad. So bad. Like, throw out the good towels and the bathroom rug bad. And the soap in the dispenser. And all the toothbrushes. So, so bad. I wanted to die. I thought I might. My husband rallied, and the kids by that point were just fine, and he took them to their baseball party, but …. oh, this breaks my heart. The cookies, which never got their final icing, stayed behind. Because I had my hands on them, just 2 hours before I started throwing up, so obviously I was already sick, and there was no way I could serve these cookies … these PLAGUE COOKIES, likely covered in whatever was causing me to revisit every meal I have ever eaten … to our unsuspecting new friends. To the right, an action shot, of 6 dozen sugar cookies being tossed into the garbage. Jesus wept, for sure, in my house today. What kills me is, they tasted pretty good. I flavoured them with lemon and raspberry, and if we hadn’t gotten the plague, and I hadn’t handled these cookies and then gotten sick, they would have been so cute.They weren’t just show cookies: these puppies were the real deal! So, that is the story of why we threw out 6 dozen cookies, 4 towels, 4 hand towels, 8 washcloths, a bathroom rug, 5 toothbrushes, a bar of soap, a bottle of shampoo, a pair of pajamas and a stuffed animal this week. They don’t call it purging for nothing.